The final installment of a four part webinar series to guide partner-facing channel professionals through common marketing and communications concerns. 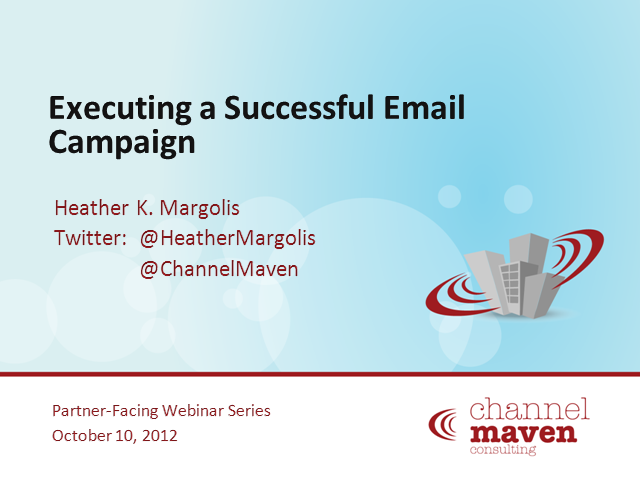 This webinar will walk channel professionals through executing an email campaign to and through your partners. *Build upon that foundation to execute "Through" marketing success. Part three of a four part webinar series to guide partner-facing channel professionals through common marketing and communications concerns. The webinars are designed to help these professionals market to and through your channel partners. Part two of a four part webinar series to guide channel account managers and other partner-facing channel professionals through common marketing concerns. The webinars are designed to help these professionals market to and through your channel partners. Part one of a four part webinar series to guide channel account managers through common marketing concerns over four months. The webinars are designed to help channel account managers better market to and through your channel partners. We respect your time, so each webinar is designed to be brief and impactful. Channel Maven Consulting provides strategic channel consulting and marketing consulting to IT channel organizations of all sizes. We are your strategic channel program and channel marketing partner. So what does that mean? We know not every channel strategy or program fits every organization. That’s why we work with you to understand your current channel programs, define your goals, and assess your resources. Then we pull from industry best practices and current innovations to help you drive more effective relationships both to and through your partners. Along the way, our clients don’t just find their place on the map, they gain insights on their unique advantages.